Although LoadTubes presents itself as a useful browser add-on that helps you to download YouTube and other streaming sites videos in mp3 format, there are also a number of security risks related to this application. In fact, LoadTubes is an adware program, that can considerably slow down your Internet connection, because it generates a stream of pop-up advertisements whenever you enter video streaming websites. 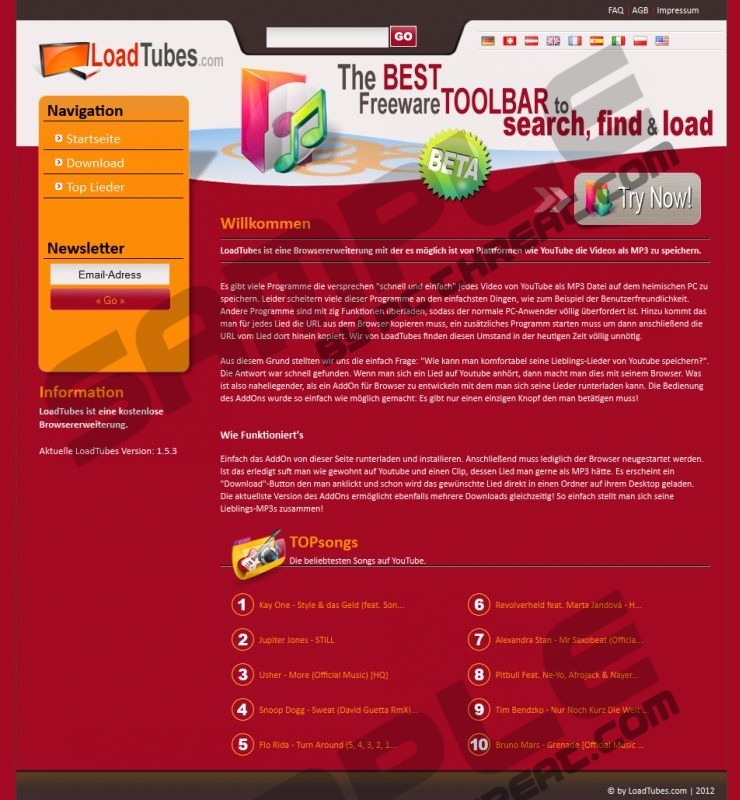 Therefore, in order to avoid any possible malware infections, you should remove LoadTubes from your PC. Probably one of the most important things about this program is that LoadTubes does not enter your system surreptitiously. You are prompted about the oncoming installation, and you can actually download the application yourself at loadtubes.com. The official website claims that this application is a browser add-on that installs a toolbar on your browser. However, if you go through the installation process, you will see that no toolbar gets installed on any browser - Internet Explorer, Mozilla Firefox or Google Chrome. You can only see that an extension has been added to your browser on the extension list. When you open a video streaming website such as YouTube you will get a pop-up window with download information. When Charms bar appears, click Settings and go to Control Panel. Click Uninstall a program and remove loadtbs-2.1. Select Add or remove programs and uninstall loadtbs-2.1. Eventually, run a full system scan with SpyHunter free scanner. It will help you find out whether you have any other undesirable files left on your PC. Remove them if necessary. Quick & tested solution for LoadTubes removal.